Starting this weekend, we are offering for the first time ever, free delivery for all barbecues and combos to metro postcodes in Sydney, Melbourne, Brisbane and Adelaide. This is a strictly limited time offer for one month or until stock runs out so don’t miss out – you could save $$$. Contact us for your unique discount code now. Time is fast running out if you want to be cooking your Christmas turkey in a new ChefMaster. Our warehouse closes midday this Friday! Our warehouse will be closing for the Christmas break at lunchtime 21st December, re-opening 2nd of January. There will be no orders dispatched during that period and no customer pick ups possible so get in early if you want to be cooking in your new ChefMaster on Christmas day! We are committed to protecting personal information that you share with us through the Internet. We will collect information from you in two ways, using technology (e.g. IP address) and through your voluntary submission of information. Anonymous information is collected when you visit this website. Our site can collect information about the type of browser you are using, your operating system and your IP address. An IP address is a number that is automatically assigned to your computer and is recognized by web technology whenever you are surfing the Internet. None of this information is considered personally identifiable information. To purchase a bbq you will be asked to provide personally identifiable information which may include your email address, your street address, your credit card details etc. We will not trade, sell or share such personally identifiable information for use by any third parties unless we have informed you, been authorised by you or are required by law to do so. Your credit card number is used to process your request for products and will not be shared with third parties that are not involved with the transaction. For marketing and promotional purposes, including to provide you with information about products and services offered by BlueTongue BBQs. Our web site may provide links to resources that we believe could be useful. These links will lead you to web sites operated by third parties that operate under different privacy policies, and we suggest you review their privacy policies as we have no control over information you may submit to those third parties. Security for all personally identifiable information is extremely important to us. To prevent unauthorized access, maintain data accuracy and ensure the correct usage of information, we monitor and adjust our physical, electronic and managerial procedures to safeguard and secure the information we collect online. Unfortunately, we cannot guarantee that data transmitted over the Internet will always be secure. As a result, while we strive to protect your personally identifiable information, we cannot ensure or warrant the security of any information you transmit to us or from our online products and services, and you do so at your own risk. Upon receipt of your transmission, we strive to ensure the security of that information in our systems. When purchasing from Blue Tongue BBQs your financial details are passed through a secure server using 128-bit SSL (secure sockets layer) encryption technology.128-bit SSL encryption is approximated to take at least one trillion years to break, and is the industry standard. If you have any questions regarding our security policy, please contact our customer support centre. Every ChefMaster BBQ comes with a rotisserie. Every BlueTongue model comes equipped with a 240v rotisserie kit but who really knows how to use one? 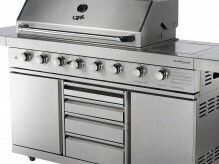 BBQ weather is here so click on the post title to read some of the most frequently asked questions when setting up your new ChefMaster barbie. The ChefMaster range offers Premium Value, Feature Packed combos at Unbeatable Prices!